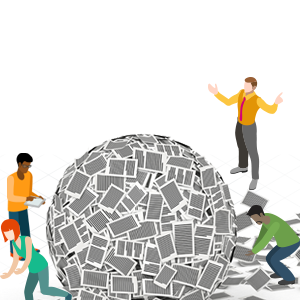 With 60% of office time being spent on document management, it's important to make sure your company has streamlined processes that maximize employee productivity. We've put together a list of the top time-wasting practices employees engage in during the document lifecycle. How do you rate? See how many of these apply and see where you land on the document lifecycle spectrum. Your computer desktop looks like you saved every file you've ever downloaded. You can't ever find the document you're looking for because icons are stacked on top of each other, but you refuse to delete anything for fear you'll need it some day. The downloads folder is a place you only venture into in order to fish out your most recent document download. Years of neglect have turned it into an insurmountable mess you dare not approach. This isn't the file you were looking for. Jedi mind tricks won't save you after wasting time working on the wrong version of a document. You have no way to digitally comment on or mark up documents, so you end up printing everything out for manual review. With multiple people reviewing, that ends up being a mountain of paper. Wasting time manually searching through documents for each instance of a word or phrase to edit or remove them. One always manages to slip through. Your company limits the size of files you can send through email, which requires you to to add a bunch of extra steps and use external file storage options each time you need to share documents. Rather than using automated digital workflows to route documents for review and approval, you're still hand-delivering files around the office. Cross your fingers that it doesn't get lost in the shuffle. Nothing like going from digital to analog to digital again to make you feel like you're stuck in the past. Printing, manually filling out or signing documents, and then having to scan them to submit or share is so last decade. See how one company made it easy for clients to digitally collaborate on documents. Read our whitepaper: Identify and Simplify the 4 Phases of a Document Lifecycle. Discover how PrizmDoc can improve your document processes.